You can not purchase more than 3 books. If you want to purchase more than 3 books, Please share the quantity and details with us. 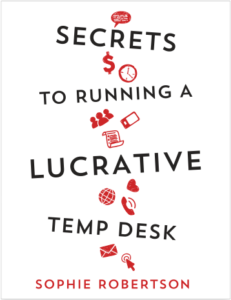 In this comprehensive book full of real-life case studies and based on many years of personal experience and success, Sophie Robertson outlines the processes involved in running a highly lucrative temp desk, which will both strengthen your client relationships and ensure you become the employer of choice for top-quality temps. Robertson explains why temp consulting is a completely different job to permanent consulting and answers all the questions you've always wanted to ask: • Why do some recruitment companies have thriving, money-spinning, loyalty-inducing, growing temp desks that shield and buffer them from economic downturn, while others simply don't seem to be able to grow their temp hours to a significant level? • What are the must-have qualities of a successful temp consultant? How do you supercharge your temp hours for financial and business success? • How must temp consultants adapt to stay relevant in the ever-evolving recruitment industry? • How do you add maximum value to your recruitment business when getting it ready for sale? Here is your chance to get a slice of the multi-billion dollar contingent workforce industry by knowing exactly what you need to do to be successful. There are very few reference materials specific to temporary recruitment consultants. Most references are in a passing section of more permanent orientated recruitment books. 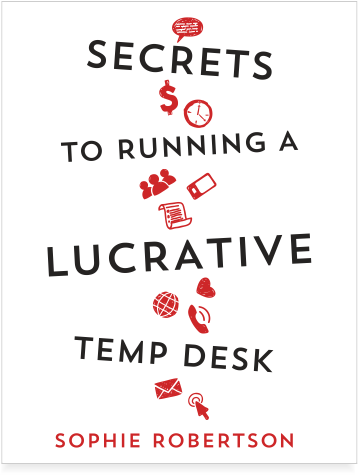 Secrets to Running a Lucrative Temp Desk starts out with a great series of insights into the mindset of a successful temporary recruiter which set the tone and context for all the very helpful advice and procedures that follow. Each section is easy to read and clearly set out with case studies from Sophies past experiences backed up with examples to help visualize the benefits of each piece of advice as well as explaining clearly how to put these into practice. When reading books like this I like to fold the corner of any pages which had helpful tips that would benefit myself and my team in the future. I stopped this process after a third of the way through once realizing I would end up with a book with every other page corner turned! As a result I have since purchased copies for all of our temporary recruiters and their managers to use as part of our induction process with results already being seen with candidate retention increasing and new clients coming on board as a result. The most impressive factor since implementing Sophies book into our business has been the speed at which new recruiters have been able to convert their training into real world results. A fantastic, concise and knowledgeable book which I recommend being used by recruitment companies around the world which adds value and most importantly confidence to anyone working within the temporary recruitment market whether they are fresh to the industry or have years of experience. Rem Kingston, Director of Diamond and RemTech in the UK. I ended up buying a further two copies of your book, three in total to give to two new consultants in my team. It is being used as a great learning device, with the three of us reading certain chapters every few days and then sitting down collectively and discussing what we learnt and what we can implement. New staff through to experienced Directors can learn from this book. I can not recommend it highly enough.